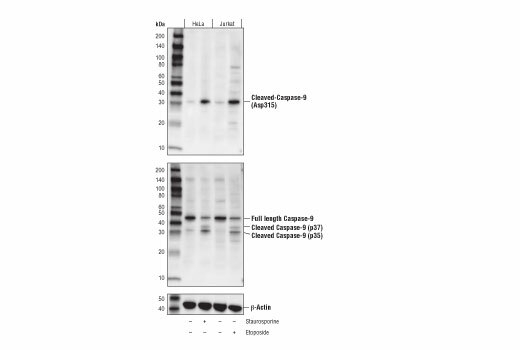 Western blot analysis of extracts from HeLa and Jurkat cells, untreated (-) or treated with Staurosporine #9953 (1 μM, 3 hr; +) or Etoposide #2200 (25 μM, overnight; +), using Cleaved-Caspase-9 (Asp315) (D8I9E) Rabbit mAb (upper), Caspase-9 (C9) Mouse mAb #9508 (middle), or β-Actin (D6A8) Rabbit mAb #8457 (lower). 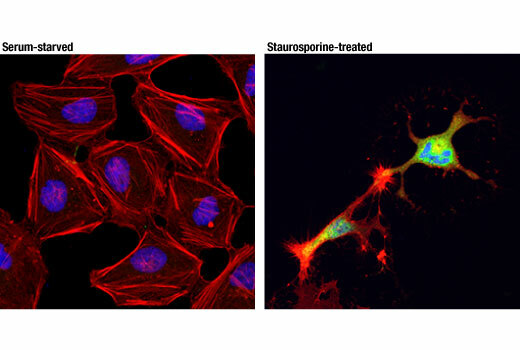 Confocal immunofluorescent analysis of HeLa cells, serum-starved (left) or treated with Staurosporine #9953 (1 μM, 3 hr; right), using Cleaved Caspase-9 (Asp315) (D8I9E) Rabbit mAb (green). Actin filaments were labeled with DyLight™ 554 Phalloidin #13054 (red). Blue pseudocolor = DRAQ5® #4084 (fluorescent DNA dye). Flow cytometric analysis of Jurkat cells, untreated (blue) or treated with Etoposide #2200 (25 μM, overnight; green), using Cleaved Caspase-9 (Asp315) (D8I9E) Rabbit mAb. Anti-rabbit IgG (H+L), F(ab')2 fragment (Alexa Fluor® 488 conjugate) #4412 was used as a secondary antibody. 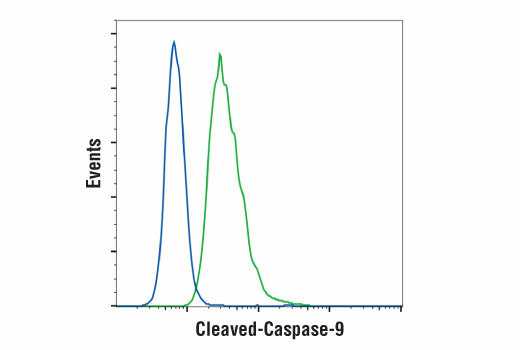 Cleaved-Caspase-9 (Asp315) (D8I9E) Rabbit mAb recognizes endogenous levels of caspase-9 protein only when cleaved at Asp315. Non-specific proteins that are induced by apoptosis under certain conditions may be detected. Monoclonal antibody is produced by immunizing animals with a synthetic peptide corresponding to residues surrounding Asp315 of human caspase-9 protein.